Here we have the Silverline available in six different sizes and they can come in Silver or Forest Green. 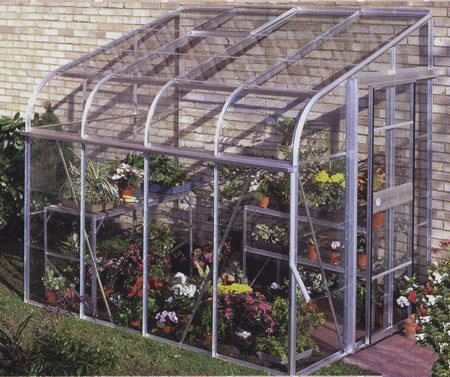 These Silver line lean to greenhouses have been made with a curved eaves which gives the lean to greenhouse a touch of style. Made especially as a lean to you can attach to your house, garage or garden wall it has been designed to trap not only the warmth of the sun but the heat from house too which will help your plant whether they are seedlings or less hardy plants. 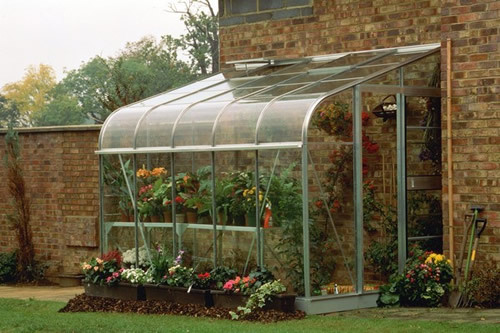 Silverline greenhouse provides ventilation throughout the sizes, all except the smallest one comes with two vents and the smallest greenhouse will come with one vent as standard. All the Silverlines except the sunrooms come with a single sliding door and the sunrooms come with double sliding doors. Two glazing options are available with these greenhouses Standard 3mm Horticultural Glass The traditional glazing method. Allows sunlight in to nurture young plants. Small pane 3mm Toughened Glass Allows sunlight to nurture plants in the same way as Horticultural Glass, but gives added safety. The Silverline Sunrooms the bigger two greenhouses will come with long pane toughened glass as standard. Additional Accessories such as staging, shelving, rain kits etc. can be found in the Halls Greenhouse Accessories Section on our website, or contact us for one to one advice. Here we have the Silverline 86 manufactured from aluminium. Complete with a single sliding door and one roof vent. The lean to greenhouse measures 2.59m deep x 1.91m wide.